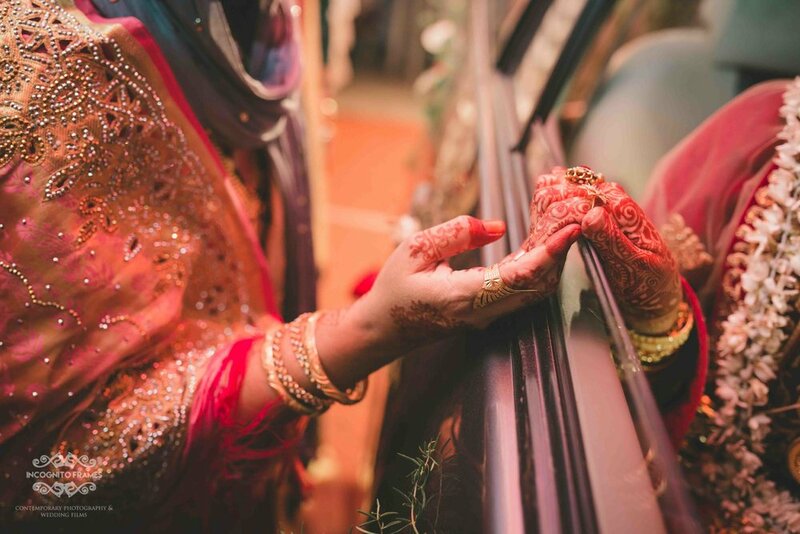 Weddings in India are never short of emotions, A mother's touching alvidha to her daughter. One of our favourite shots ever! and one of our most popular and liked image, the last wedding we shot in 2017. Second day from a traditional Muslim wedding in Chennai, Nikka. Indian wedding photographers are the most blessed! We can proudly claim that because no country in the world, to the best of our knowledge has so many different kinds of traditions, which has been passed for hundreds of years and rich in culture, custom and tradition. Its no secret that Indian weddings are filled with traditions, rituals, vibrant and colourful which is a treat for a wedding photographer and this is the place where an English wedding, Nikka and a traditional Hindu wedding no matter in which part of India you stay at and no wonder, photographers from around the world have turned towards India and aspires to be an Indian wedding photographer! Incognito frames is a team formed during the transaction times in Indian wedding photography, when candid wedding photographers started to take centre stage. This was a crucial time in Indian wedding photography, just like the industrial revolution and renaissance times, a time when candid photography was born in India and people in India started appreciating the photojournalist approach a candid photographer brought in Indian weddings over the next few years (till date ) a young breed of Indian wedding photographers were born! Though some of our team mates have been in the wedding photographers industry for the over a decade and used film rolls, majority of our team members belong to this young generation which sees wedding photography as highly respected and a highly paid career. A time where a photographer was hired by checking out his work online, this was the time when photographers stated giving importance to his online space more than shaping up his studio and this is the time where the photographer din't own a studio but still got hired! Scenes from a South Indian, Brahmin wedding in Hosur, India. A brahmin weddings, especially in the South is a 2 to 3 days event and is filled with rituals, here the bride and groom walks towards the wedding dice after performing a few rituals outside the wedding hall. But at the same time, being an Indian wedding photographer is no easy job, as a photographer who strives to give out his best to the client, the photographer must be aware of the tradition that one is about the shoot, unlike international weddings, which is doesnt vary much from one state to another here, here in Indian, there are hundreds and thousands of wedding traditions and only if you are aware of what is going to happen next, you would be able to prepare yourself otherwise you should consider yourself lucky if you are still get a few good pictures. Most of the Indian Weddings that we have done in the past are through referrals and we have happy to know that we are team of wedding photographers who work through referrals and all the wedding blogs and posts are through our team and we do not spend money with any marketing agents. Though we do not believe in being ranked as a Top wedding photographers in India, we are honoured to be ranked one among the many greats in Indian wedding photographers. We believe that it is pictures like these, that makes wedding photography appealing. A Malayalee Christian wedding in Chennai. Father comes in to check if the bride is ready for prayer, before leaving for the wedding. Today Indian wedding photographers are compared to the best in world and the wedding industry in India has become huge! Its so big that many photographers from the west are doing projects from here. Incognito frames is a brand which has evolved itself over and has become a trusted brand with an experience of close to hundred Indian weddings! We provide complete solutions in wedding photography in terms of covering candid wedding photography, traditional photography, traditional videography, wedding film - cinematography and providing world class wedding albums to freeze your memories forever and of course we are known for our pre-wedding photo shoots. The best part of our team is we work exclusively and do not take up multiple weddings at the same time. Sometimes during the conversation with our client we get asked "what sets you apart" well the answer is simple, we take good pictures! :) To give you a more detailed answer, it would we have a photojournalist approach in narrating a wedding, so basically we do not interrupt much in during a wedding, we prefer shooting the wedding as it unfolds and our pictures are a mix of fine art approach in it. The best way is to go through our wedding gallery and one thing which we specially tell our client is we are a team which offers exclusive service, which is we shoot only one wedding at a time and we have a policy not to shoot multiple weddings at a time because the client decided to go with us because they have felt something appealing in our work and completely unfair to outsource another professional photographer with whom we have not worked with. Though we nothing against sending a team to the venue. To sum it up, Indian wedding photographers are blessed because he will get the best of Hindu Wedding, Muslim weddings as well as Christian weddings, which are in complete contrast with one and other! Just like how candid photography took centre stage to Indian weddings a few years back, slowly but very steadily wedding films are taking over traditional wedding videography. Today there are many couples who prefer a wedding films, which would span just around 5 minutes to a regular traditional video which could run up to 60 minutes. The reason why wedding films have started to trend is the cinematic approach a montage, this is the ultimate chance to be the hero and heroin onscreen and main factor is the short duration of the complete film, which makes it easy to share and enjoy the footage. Wedding films are nothing but a candid version of regular video coverage and Today, one of the most asked question to Indian wedding photographers is "Do you do wedding films" We answer with a emphatic "Yes"
Niraimathi & Hari's wedding teaser" is one our most watched video in our Youtube channel. We started doing wedding films only two years back and this is one of earliest and favourite work, though we have evolved a lot from where we started, we are still proud and happy to show our customers what we did in our early days. To keep track of our regular wedding films check out our Youtube channel here. Wedding invites are slowly, very slowly turning digital, though the wedding invite concept is still its infant stage here, the wedding photographers fraternity have defiantly started noticing this trend, though can never surpass a traditoanl hard copy wedding invite -ever, in the coming years, this will play a huge role and has the potential to be a deciding factor while choose a wedding photographer! We got to shoot one such wedding invite for this beautiful couple and full credit to come up with such a concept goes to the couples themselves and though for we are delighted that this video has gone viral to a very very small extend and have hit close to 4000 views which is huge for us since we dint promote the video in any way. Introducing Gifs: So how popular is Gifs in Indian weddings? Frankly we have never seen gifs being used in an Indian wedding or even in International weddings for that matter, we love gifs and it looks fantastic when captured at the right time and that is the only reason we decided to do "GIFS"
We assume that we are one of the pioneers in introducing gifs in Indian weddings :) Though gifs are not something that plan to shoot in every wedding, it just happens, check our gifs page for updates on gifs from Indian weddings and post/pre-wedding shoot. Today an Indian wedding photographer's package becomes incomplete without mentioning the post-wedding photo-shoot, we have done plenty of post/pre-wedding photo shoots in Chennai and we have a separate and proud gallery of our works here. Sunrise shots in Marina beach, Chennai is something we love to capture, the colour of the skies are always unpredictable, the fresh air adds beauty to the picture and the silhouette shot makes it picture perfect. Venue in an Indian wedding is most important factor for both families, frankly the selecting a wedding photographer for an Indian wedding is only secondary. Venue: ISKCON Temple, Shollinganallur, Chennai. Marina Beach in Chennai is one of our favourite spots to shoot, as well as the most underated outdoor photo shoot locations among wedding photographers in Chenna., a pre-wedding shoot in progress, circa 2016. Incognito frames, is a team of premium top-notch Indian wedding photographers and technicians who have mastered to art of narrating an Indian wedding in the most exciting way possible. We are based out of Chennai, travelled all over Tamil Nadu and have shot wedding across India. Let us know if you have a wedding in hand, our exclusive team is always ready to shoot your wedding, no matter if its a simple temple wedding or an exotic destination wedding or something in between, we simply love to shoot weddings. .